So there I was, sitting at my desk, eating Nutella with a spoon, thinking about how much I just wanted to have a nice evening to myself. 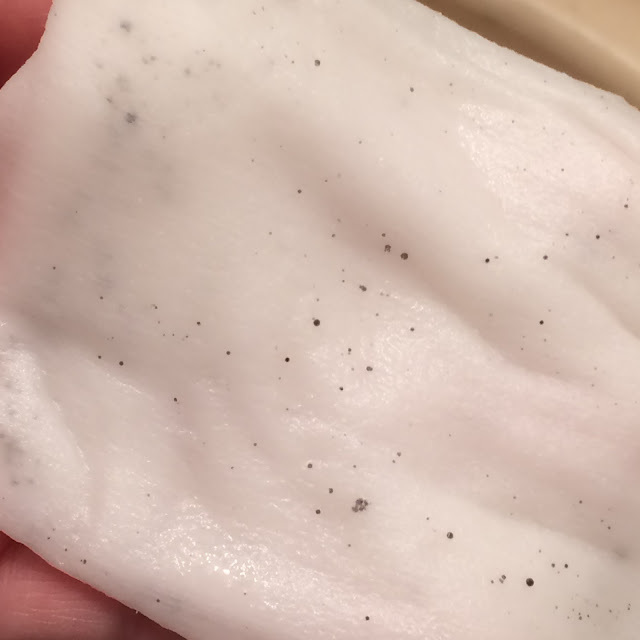 When suddenly it dawned on me that I have some "special occasion" sheet masks collecting dust, waiting for me to decide it's time to use them. This night, my friends, would be one of those nights. This night, being Valentines Day. And special occasion, being "I hate my life and want something to enjoy before my family makes me rip my hair out." 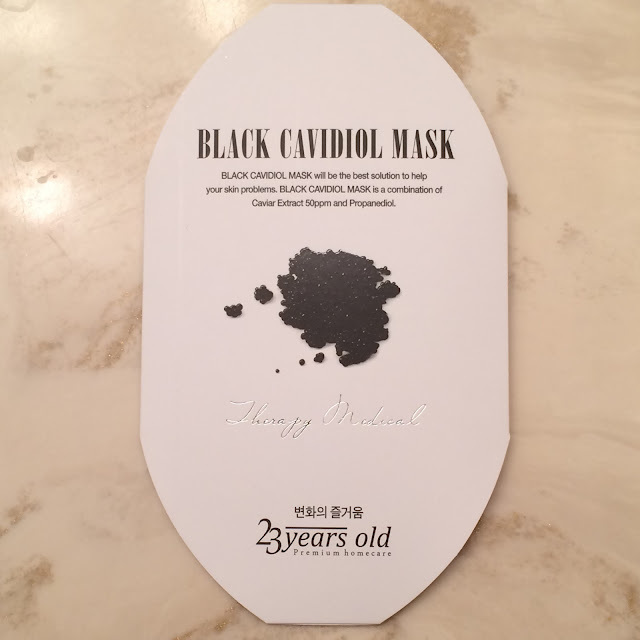 So that's the night that I finally broke down and used my 23Years Old Black Cavidol Mask. 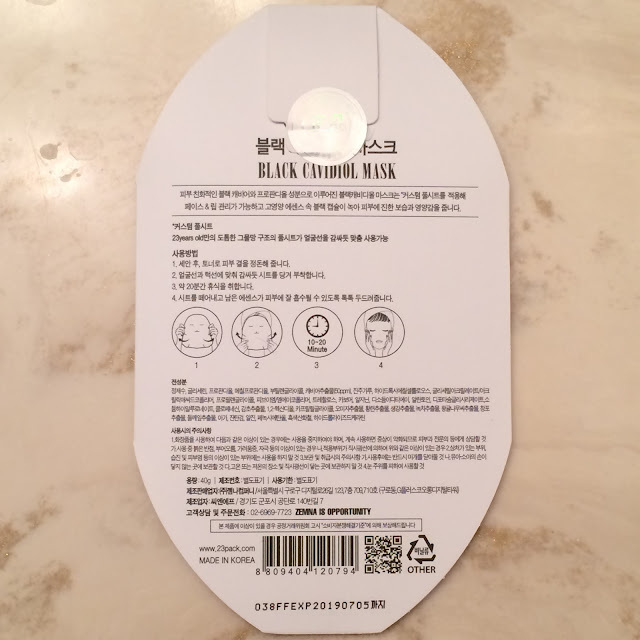 This mask is a super thick microfiber cotton designed with "tension sheet technology" which allows it to be stretched and wrapped around the face comfortably without tearing. The essence contains 50ppm caviar extract and propanediol. 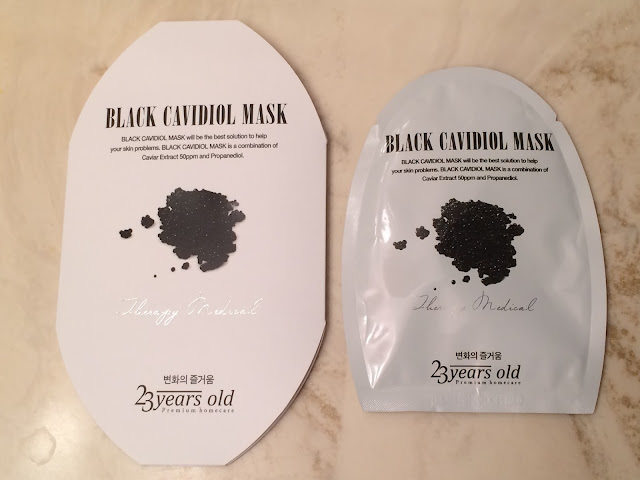 Caviar extract is an excellent ingredient to combat anti-aging as it rejuvenates the skin and promotes collagen production, while brightening the skin with omega-3 fatty acids, and protecting the skin from environmental stress. 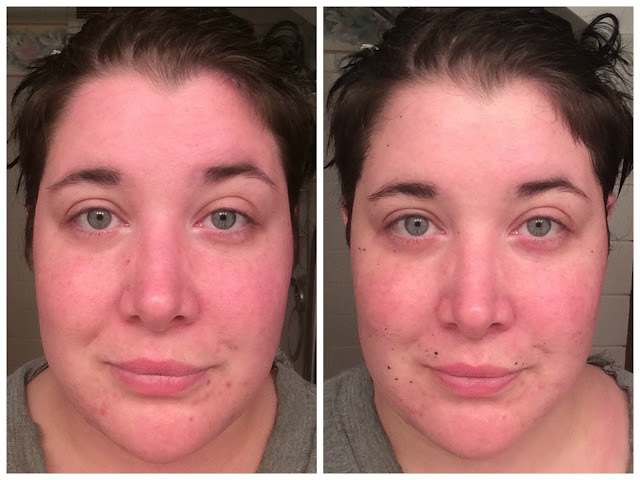 Propanediol is designed to enhance the absorption of other ingredients, and leave a dewy finish on the skin. Where in my routine does this fit? Normally I use sheet masks after my serums and ampoules to help everything absorb better before I seal it all in with a moisturizer or sleeping pack - but they can also be used after cleansing and toning if you prefer. Water, Glycerin, Propanediol ,Methylpropanediol,Caviar Extract, Pearl Powder, Hydroxyethylcellulose, Glyceryl, Acrylate/Acrylic Acid, Copolymer, Propylene Glycol, PVM/MA Copolymer , Trehalose, Carbomer ,Arginine ,Disodium EDTA, Allantoin, Dipotashydsium Glycyrrhizate, Sodium Hyaluronate, Chlorphenesin, Butylene Glycol, 1,2-Hexanediol, Caprylyl Glycol, Glycyrrhiza Glabra (Licorice) Root Extract, Schizandra Chinensis Fruit Extract, Coptis Japonica Root Extract ,Zingiber Officinale (Ginger) Root Extract, Camellia Sinensis Leaf Extract, Citrus Grandis (Grapefruit) Seed Extract, Acorus Calamus Root Extract, Perilla Ocymoides Leaf Extract, Agar, Xanthan Gum, Algin, Iron Oxides,Phenoxyethanol, Hydrolyzed Keratin. You may have noticed above that I posted photos of two sets of packaging. No - I didn't post doubles! 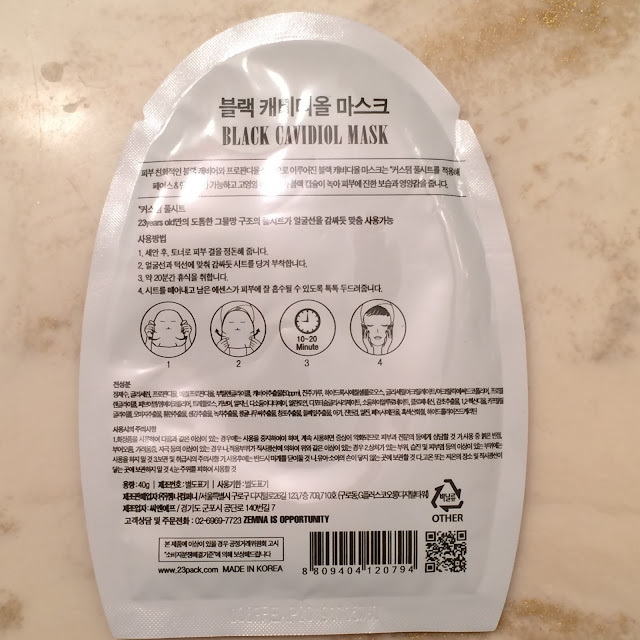 This mask comes in the traditional foil mask envelope that you tear open and remove the mask from, but that envelope is individually packaged in a thick paper envelope of it's own. 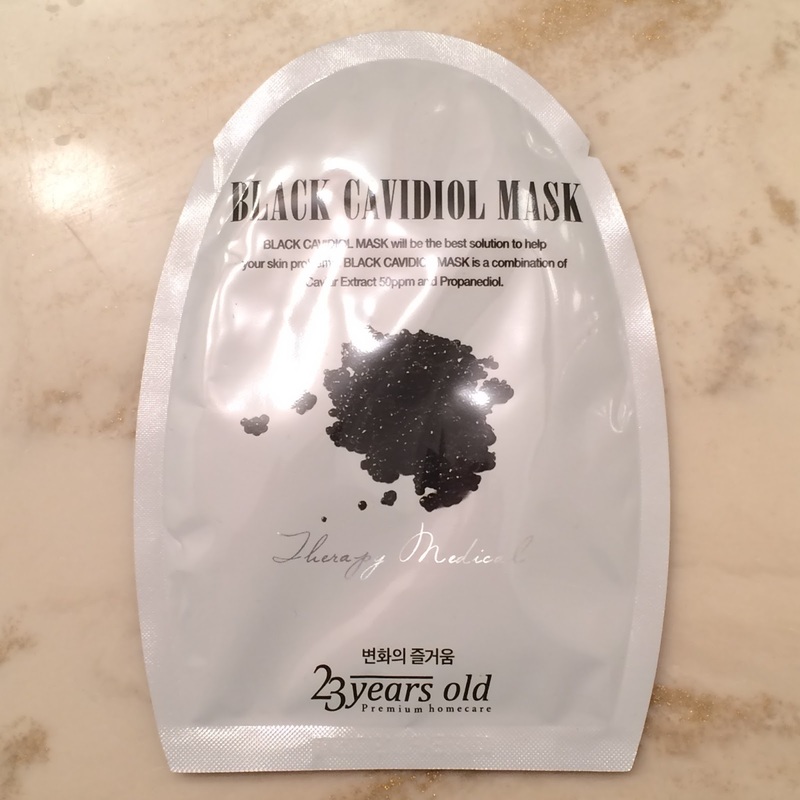 There is no pearl-paper backing on this mask as it's so thick, but the foil did have extra essence aside from the already dripping mask sheet. 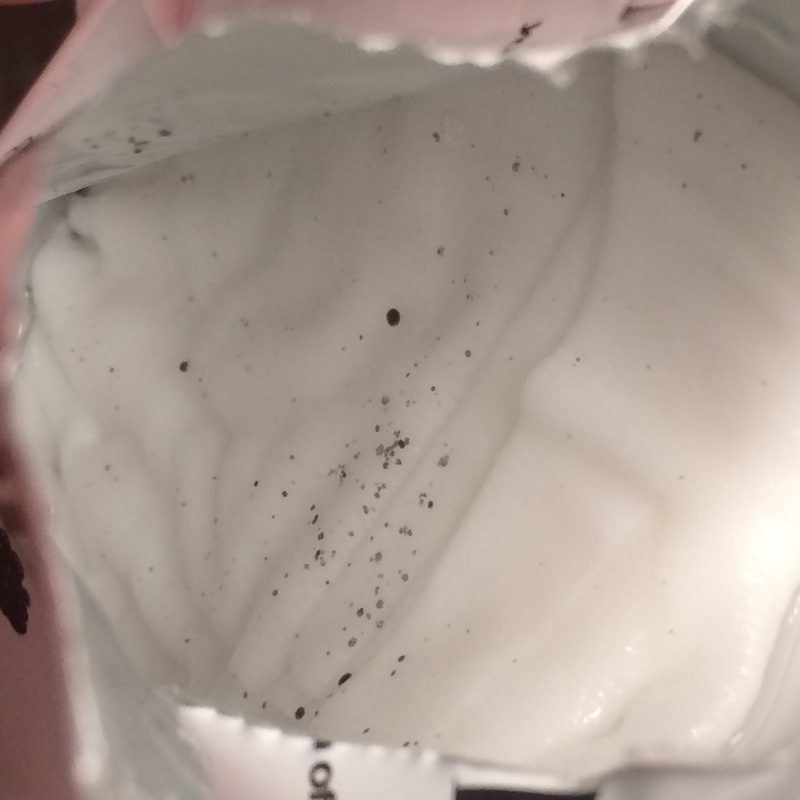 The essence is thick, but not sticky. It doesn't really have much of a noticeable scent, which I enjoyed since this mask has no mouth opening (look for a photo below). My only other complaint is that I know there will be people who won't use it because there's no mouth opening. 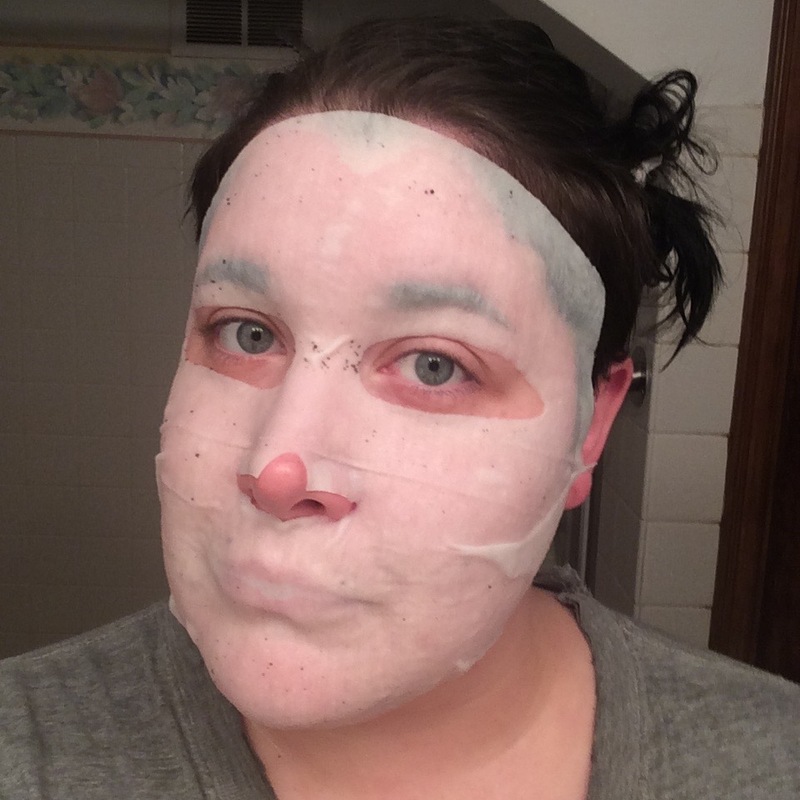 I'll admit - I hesitated using this mask because of my claustrophobia, but it wasn't bad! I personally found that this helped hydrate my lips a lot - but I know not everyone will feel as happy about this as I am. At $6 a mask these are a little steep but again not overly expensive when you look at some other masks that cost more but are not nearly as high of quality as this one. So while it's spendy for a broke mama like me, this is one that I will splurge for when I can afford to.